All right. Call me crazy… but I don’t have anything else to post… So I am posting the first 250 words of my new novel which is the sequel to LAST WINTER RED from the Make Believe Anthology. I just wrote this about three hours ago, and it has not been proofed. What I’m looking for is world-building. Can you feel the world? There is no scenery yet. What would you like to see in this scene to help you visualize? This is a sequel. For those of you who have read LAST WINTER RED: Does this draw you right back into that world? “Pish. Today you are just getting married. Nine months from now, when you validate yourself with your first child—that will be the most important day of your life.” She brushed non-existent lint from his shoulders. “Of course mother.” Henry held perfect, stiff posture as his mother moved around him, her long red skirt shifting at her ankles as she straightened every seam. She picked up a pitcher from the table and poured two glasses of water. “I will do my best, Mother.” He bowed his head. 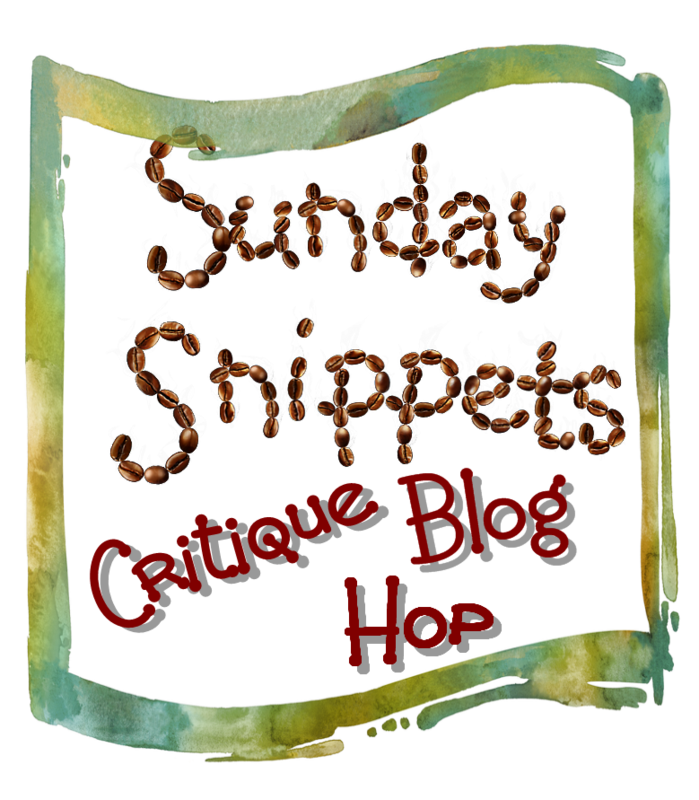 This entry was posted in Critique Blog Hop, Sunday Snippets and tagged critique, Mother, Publishers, Sunday, Sunday Snippets Critique Blog Hop, Tools. Bookmark the permalink. Love your dialogue, that’s a consistent strength of yours and it’s great to see that’s the case even in first draft. This world is intriguing. I can feel the tension zinging through the conversation and the press of how important this is. Quite hard to do in so few words. Wow. I need to read more of this. I can certainly visualize the characters and their dress, and the pressure is surely piled on! Would be interested in more about the physical surroundings, and who else there is besides the (evidently elite) Reds. Definitely an intriguing start. Super start I got a sense that his mother was pressuring him a great deal for the honor of the Red’s. Would a mention of the actual room/area they are in help? Good hook for the reader. I’d say you do a great job of showing your world in such a brief number of words. His cuff, her skirt, and then she calls him a Red–it’s clear the color is important and symbolic, even if the reader doesn’t know exactly what. And Mommy Dearest there, oh, boy! The pressure she’s putting on him to be perfect where his other siblings failed… Poor guy, it can’t end well. I felt I was missing a sense of time relative to the marriage ceremony, and their location. It feels like he’s getting married soon, but I waffled between him being like a bride almost ready to walk down the aisle, or getting ready to leave for the church. If I knew those things within a few paragraphs, I’d be a happy reader. I like the clipped tone Henry uses. I wonder if he’s more looking forward to getting out from under his bossy, I mean loving mother’s thumb. The tension is awesome. Who wouldn’t be nervous with the pressure he’s under: “…the prestige of a wedding day conception. Whew, looks like Henry’s in for quite a day! You’re definitely giving the reader a sense of the world and the importance of procreating for the Reds. I’d say you’re off to a good start on the draft. Love the symbolic red, the dialogue, and the scene. It is a new take to hear the mans perspective and fear. Mom does come across as high pressure. Not sure if that’s a set up for the future failure or disappointments. Can’t wait to see where this sequel is going. Is this going to be a standalone or another short in a collection? It looks like this is going to be a novel-length stand-alone. Since I will be showing Terra in this work, the amount of world-building just can’t fit into anything too short. Wow, mom seems like such a b…I mean, lovely person. Love the feel of the setting and you answered a question I had before: if there were “Red” men. I was’t sure if ‘Red’ was assigned only to women or not. I like what you have so far. I feel for Henry. Joe: I’ll add you into the string for next week.